Ahloo Tikki or Aloo Tikki is a snack food commonly sold among the street vendors of India. “Aloo” means potato while “tikki” means a circular croquette. It’s served with various chutneys and spices. 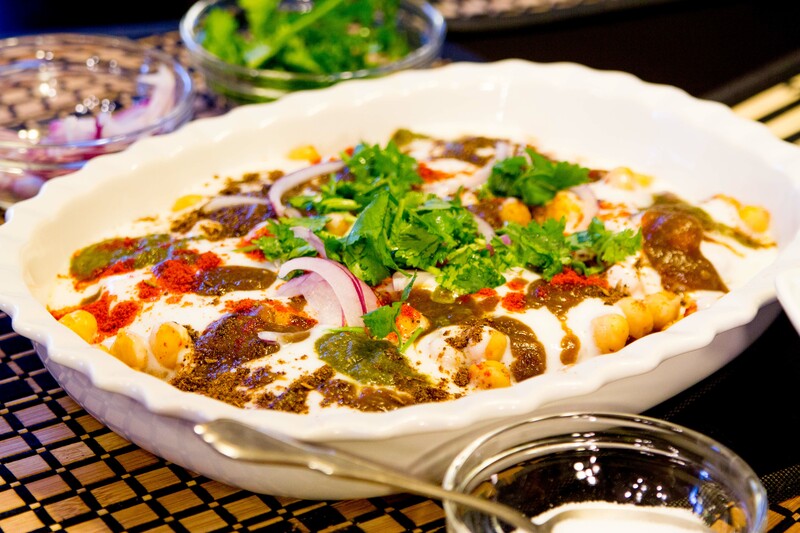 In this recipe, we’ve topped the Aloo Tikki several things including: yogurt, garbanzo beans, chutneys, and other spices. Meanwhile, make cuts into the potatoes. Microwave the potatoes until they’re mushy and soft. Meanwhile, add yogurt to a bowl. Add about 4-5oz of water to yogurt. Beat the yogurt and water like an egg. You can add or more less water depending on how thick you want the yogurt to be. Once potatoes are done, peel potatoes and mash in a large bowl. Crumple bread up and add to the potatoes. Mix. Add salt to the potato bread. Mix. Take a palm size of bread and potato mix. Roll into circular croquettes. Use a few drops of water on hands to croquettes (tikki) to stick together better. Repeat until done. Add about 1 tablespoon of corn oil to a pan. Add the croquettes to the pan. Fry for about 5 minutes or until it turns brown. Flip and repeat for the other side. Wash and drain garbanzo beans. Add them to pan. Heat them up for 3-4 minutes until warm. Add red chili pepper and salt. Mix. Top off the croquettes with the following: yogurt, garbanzo beans, sliced onions, green chutney, dates chutney, red chili powder, chaat masala, and cilantro.